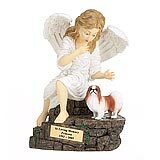 "I want to thank you both for being so kind and compassionate…you have made this purchase a pleasant one for me. God bless and have a WONDERFUL holiday season!!!" 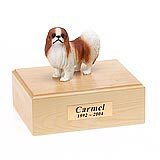 All available Japanese Chin dog urns and memorials will be displayed with the figurine on the Japanese Chin urn you select and in the appropriate size.